International Journal of Research in Health Sciences,2015,3,2,348-354. 1-Associate Professor, Department of Community Medicine, Pt. JNM Medical College, Raipur, Chhattisgarh, India. State Nodal Officer- NCD Cell, Oral Health Programme, Tobacco Control Programme, Directorate of Health and Family Welfare, Government of Chhattisgarh, INDIA. 2- Lecturer, Government Dental College, Raipur, (C.G. ), INDIA. 3- Assistant Professor, Department of Community Medicine, Government Medical College, Rajnandgaon (C.G. ), INDIA. Introduction- Dental caries is a serious public health issue and collecting data on its prevalence, incidence, and trends is an important field in oral epidemiology. The DMF index is a standard method for assessing dental caries experience in populations. The world Health Organization (WHO) recently published a global overview of oral health, a statement which described the WHO Oral Health Programmes approach to promoting further improvement in oral health during the 21st century. So the present study was conducted to assess the profile of dental health in Raipur city (C.G. ), India. 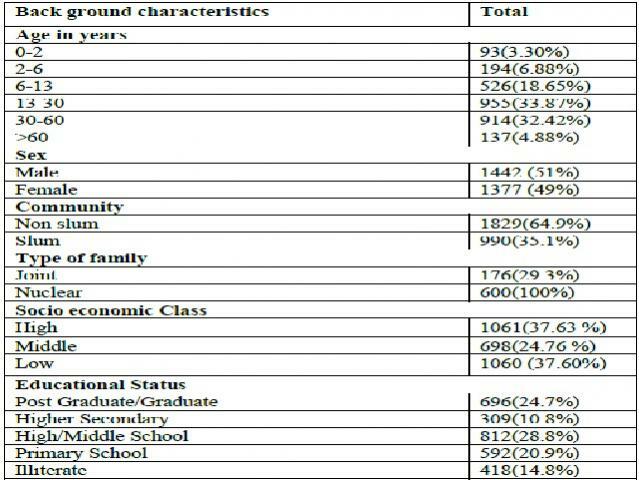 Material and Methods- A cross sectional community based study was conducted in the urban (slum and non-slum) areas of Raipur City (C.G.) from December 2002 to December 2003. Multi stage simple random sampling technique was exercised for data collection. The list of all census blocks of Raipur city was obtained from the municipal Corporation, Raipur. Sample size was calculated by employing statistical formula 4pq/L2. Data was compiled in MS Excel and checked for its completeness and correctness. Then it was analyzed. Results-Awareness in five major dental problems was 63% where as only 37% of the respondents were unaware, but in spite of awareness, the prevalence of dental caries is very high. Only 1/5th of the respondents were aware about the pyorrhea, which is significant marker of oral hygiene. Average Total DMF Index was 5.010. Percentage needing care was 10.60%, percentage of teeth lost was 4.81% and percentage of filled teeth was 23.28%. Maximum DMF Index was recorded in 60+ age- group (9.167), followed by 30-60 years (5.4) and minimum in 0-2 years age group (0.021). Conclusion- The prevalence of dental problem and type of anomalies was found to be higher among study subjects. Dental caries had significantly associated with daily frequency of meals, Chewing habits (betel nut, tobacco, and pan), post meal mouth rinsing practices and type of drinking water.